A music obsessed getaway driver attempts to escape a life of crime. Ever since James Cagney met his death to the strains of 'I'm Forever Blowing Bubbles' in 1931's The Public Enemy, popular music and the crime film have gone together like ham and cheese. Filmmakers like Martin Scorsese, Quentin Tarantino and Guy Ritchie have used the crime genre as a means of showing off their record collections, and it's difficult to imagine their movies with traditional orchestral scores rather than soul, funk and rock cuts from the '60s and '70s. 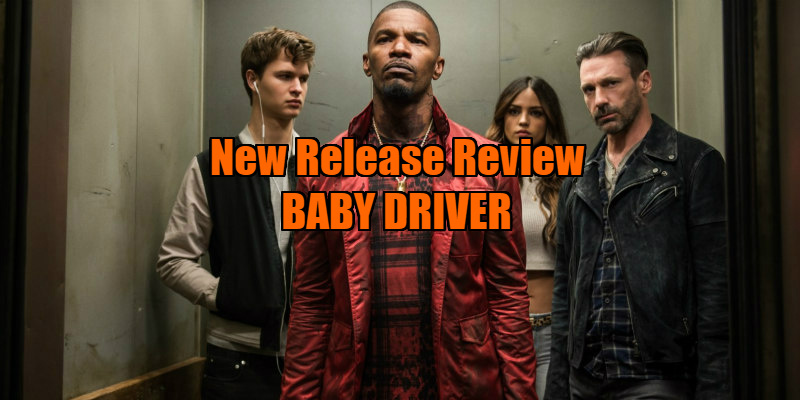 With Baby Driver, Edgar Wright takes this idea to the extreme, integrating music into his car chase thriller to such an extent that the film almost becomes a jukebox musical. His protagonist, Baby (Ansel Elgort), is a getaway driver who constantly listens to music on a variety of iPods in order to drown out his tinnitus, the result of a childhood car accident that claimed the lives of his parents. Baby is always playing music, and as an audience, we're always hearing it too, as if sharing an ear bud with Wright's anti-hero. Having been caught in the act of stealing his Mercedes, Baby has been forced to act as a wheelman for mobster Doc, driving various hoodlums to and from a variety of heists, outrunning the cops to the tune of the contents of his fruit-based musical device. When he meets and falls for adorable waitress Debora (Lily James), also a music buff, Baby decides to quit the criminal life, but, you guessed it, things don't go so smoothly. The great Australian pop culture commentator Clive James once said he would rather watch Steve McQueen crossing a street than a Fred Astaire dance number. I can't agree with him on this specific point, but I understand what he was getting at. With so many tricks in its box, cinema has the power to turn mundanity into magic. 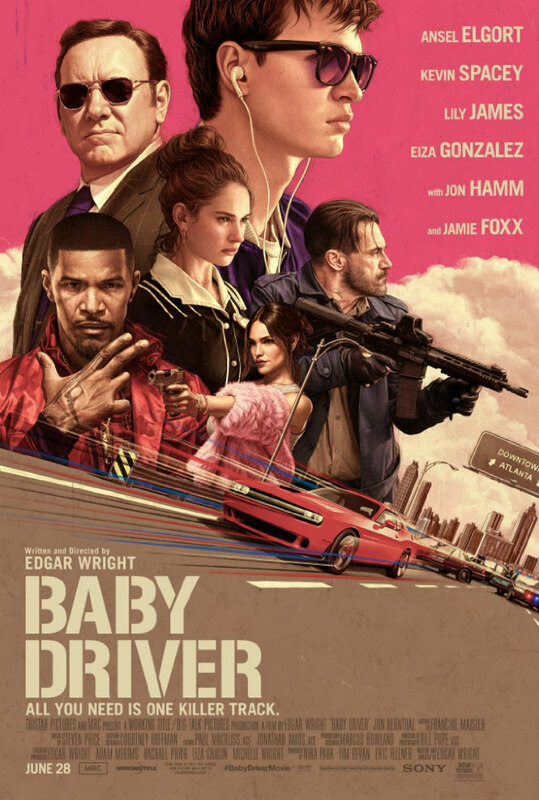 The credits sequence of Baby Driver simply follows Baby as he walks to a coffee shop and back to the warehouse where Doc's gang awaits, but Wright's camera and Elgort's elegant movement, accompanied on the soundtrack by Bob & Earl's 'Harlem Shuffle', turn it into one of the most exciting sequences you'll see all year. Immediately we're assured that Baby Driver understands the musical genre in a way La La Land didn't. Where Damien Chazelle shot his rhythmically challenged stars in head to toe full shots as though they were Astaire and Rogers, thus exposing their limitations, Wright is aware that his leading man isn't a dancer, so he lets his camera do the dancing, creating a sequence as thrilling in its simplicity as the opening of John Badham's Saturday Night Fever. Clive James also said that Steve McQueen's worst movie was Le Mans, because the star was stuck behind the wheel of a car, his face obscured by a helmet, for its duration. Wright puts his leading man in a similar situation several times here, but it's not a problem, because as soon as Elgort buckles himself in, his car becomes the dancer, the streets of Atlanta its dancefloor. Cut to the rhythm of whatever tune Baby happens to be listening to at the time, Baby Driver's car chase sequences are a reminder of the thrills Hollywood action cinema once delivered. Unlike the tired and tedious Fast & Furious movies, Baby Driver offers practical effects in a variety of set-pieces designed to thrill petrolheads and cinephiles alike. Few things are as cinematic as a well staged car chase, and in recent decades we've seen very few well staged car chases. When its leading man isn't strutting his stuff, either on foot or behind the wheel, Baby Driver begins to lag. Sadly Wright's talents as a director aren't matched by his writing skills, and the dialogue is often cringe-worthy, a poor British imitation of American street lingo that comes off as a second rate Tarantino knockoff. The characters are paperthin, especially Debora, yet another manic pixie male fantasy who seems to have no defining personality beyond a knowledge of obscure music. The relationship between herself and Baby feels forced and awkward. More genuine are the scenes in which Baby is mocked for his obsession, as though Wright is drawing on his past life as a geek growing up in an era when you were considered a freak for indulging in less than mainstream pursuits - listening to music that's too old, watching movies that are too weird, or reading books with too many words. If Baby Driver does a better job than La La Land of homaging the joys of the Hollywood musical, it unfortunately shares that film's uncomfortable racial elements. Despite being set in Atlanta, a city where more than half the population is African-American, black faces are all too noticeably largely absent. Only two get speaking parts - Jamie Foxx's volatile and violent criminal, and Baby's housemate, an elderly, wheelchair-bound deaf man. The former feels like the worst kind of 'angry black man' stereotype, while the latter comes off as a gimmick; like a dog in a horror movie, he exists merely to give the audience something to worry about. Things aren't helped in this regard by Baby's dream sequences, which see himself and Debora dressed in the regalia of '50s America, a time and place his black neighbours certainly wouldn't fantasise about. Had Baby himself been played by a black actor, it would have added an extra degree of tension to his predicament (particularly the climactic police chase), and an extra layer of commentary to his relationship with his master, Doc. Wright's film is a wild road trip through American popular culture, but in ignoring the less savoury elements of American culture, it feels like a huge missed opportunity.